So you wanna buy a short sale in Tallahassee. Well, you're not alone. In fact, most people who want to buy a short sale in Tallahassee are being disrupted by scores of people who really don't even know what they are doing. Imagine, the most perfect short sale deal in Tallahassee is in the perfect neighborhood, but when you go to make an offer on it, you find out that it is already under contract. Of course, they tell you that you can make a back-up offer, but wouldn't you rather be in first position? 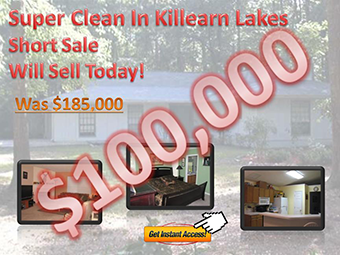 Some of the best deals in Tallahassee are short sales. They often sell at a 10% to 20% discount to the market, and for the right buyers, they are a great way to purchase real estate. Of course, like anything that sounds "too good to be true," there are some things you need to know if you are going to buy a short sale in Tallahassee. Banks are not stupid, they will not take a low-ball offer. If you want to buy a short sale in Tallahassee, you have to know the right amount to offer. Short sales do not process in a logical manner, thus you must have great flexibility on what and when you will close. Not all short sales are good deals, some are in very poor condition and should only be purchased by knowledgeable investors. If you schedule to see a short sale, you are already too late (see it now or it will be gone if it's any good). The time to buy a short sale in Tallahassee is AFTER you have put your whole plan together. To be successful, you have to be the first to write a proper real estate offer on the short sale. And to do this, you must be prepared. If you think you'll hear about a short sale today, and then go see it this weekend, you are totally missing the boat. If it is such a great deal, won't others want it? And the flip side is true too. If it is such a great deal, why is it still available days after everybody heard about it? For example, the short sale shown above was listed by Joe Manausa Real Estate and sold in less than 24 hours of hitting the market. You can still write a back-up offer though :). Meet with a lender to reduce the time you require for financing. Most lenders can knock-out a pre-approval letter, but the best can prepare you to close fast. Identify target areas and target properties, then react as fast as humanly possible when a new short sale hits the market. Be prepared to pay full price or even more if you want to buy a short sale in Tallahassee. If you follow the steps identified above, you will be in great shape. And if you would like to know more about how to buy a short sale in Tallahassee, just drop me a note and we can schedule a time to discuss your specific situation and needs.